I moved into my house a year ago. I feel so blessed every day, we absolutely love our house and have had a blast making it our own. 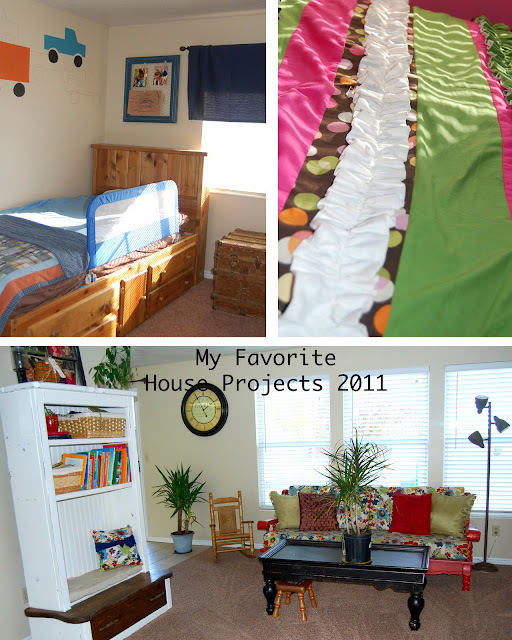 Most of these projects I have shown you readers but I wanted to do a 'looking back' post. The kid's rooms were a lot of fun. 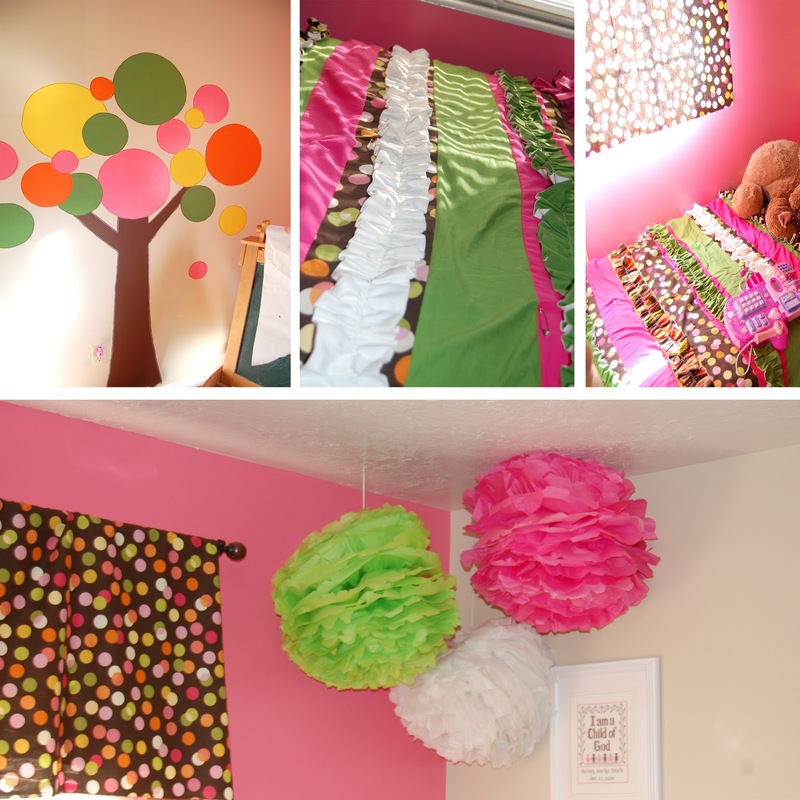 In my little girls room, I have made curtains, painted one wall pink and have painted a tree. As for the quilt . . . sadly this was one of the first projects I worked on when we moved in but it still hasn't been bound. Did I really just admit that? 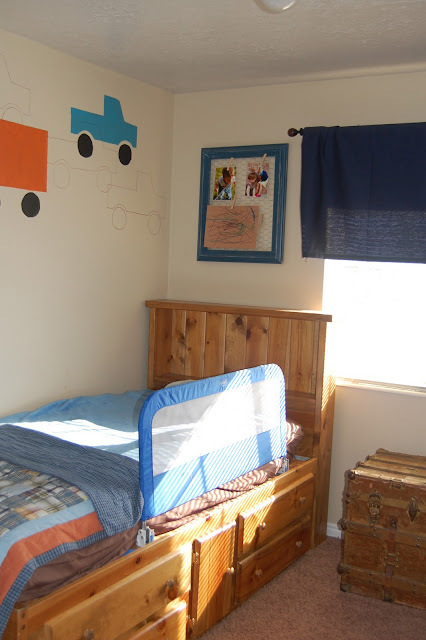 My little guys room has a wood wall art and I also painted truck stencils going along the top of the wall. 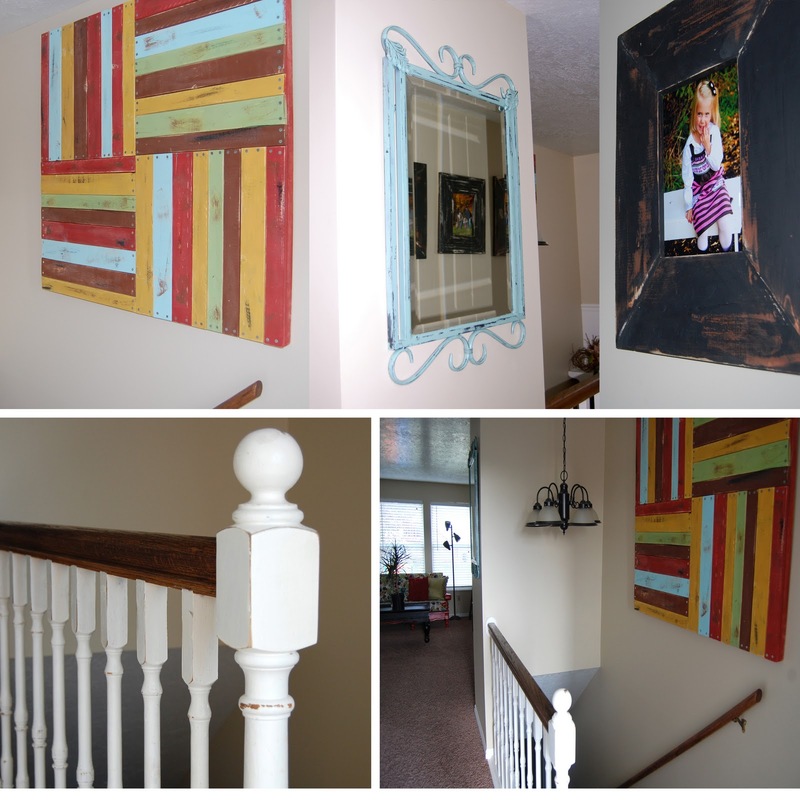 The entry, I have made frames (tutorial next week), painted a mirror frame and re-finished the banister. My favorite piece that I have done thus far is my wood wall art and still find myself stopping to look at it while passing. 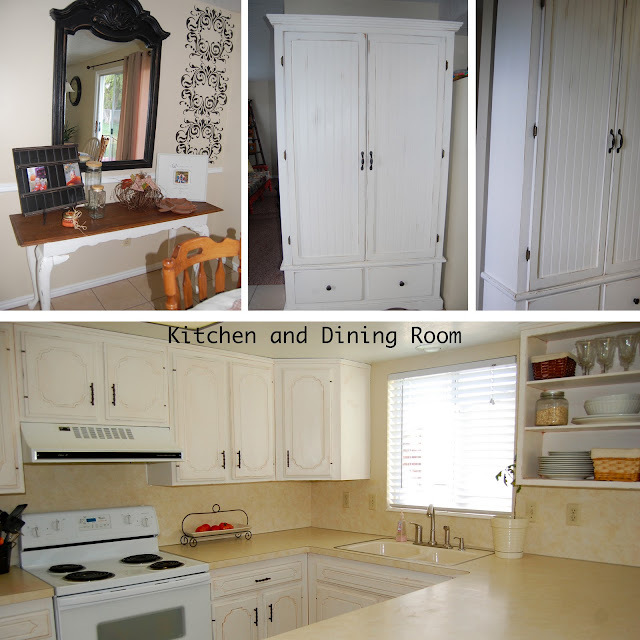 I painted all my cupboards in the kitchen and should have new counter tops by Thanksgiving, yay!! I have re-finished a piece of furniture for my pantry and a matching side table for the kitchen as well. I also did a mirror and wall stencil. My living room: A couple plans are in the works to finish it all up but I am really happy with the way it is coming together. 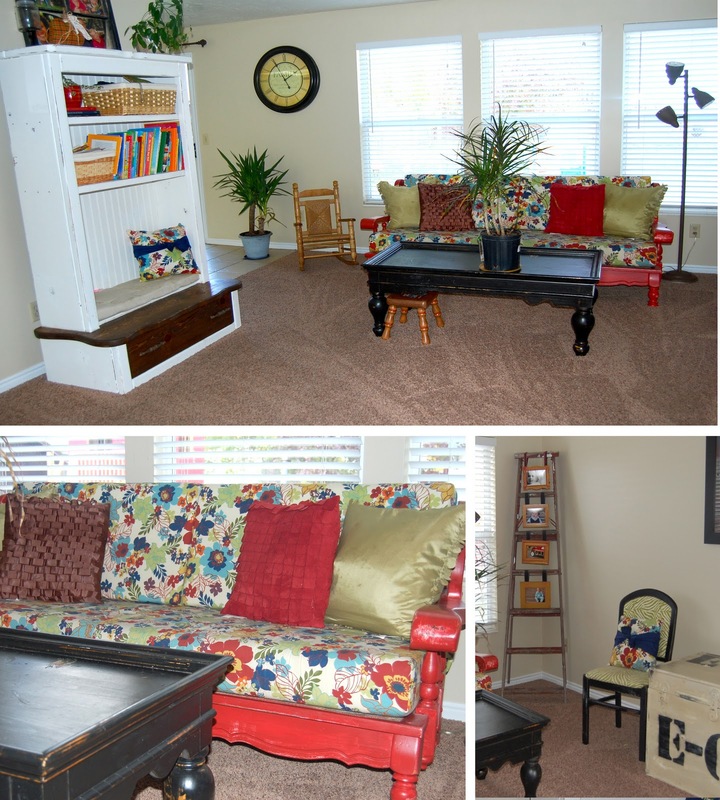 I have my book nook, re-finished couch, picture ladder, a re-finished trunk and two re-finished chairs. I hope I am not the only one but I have quite the pile of things that aren't quite finished. I have broken a piece, found something I liked better or just haven't picked it back up. For whatever reason, I have quite the list of things I need to finish. Maybe 2012 will be a finishing year. Left: Broke the swinging door while trying to add new bead board. 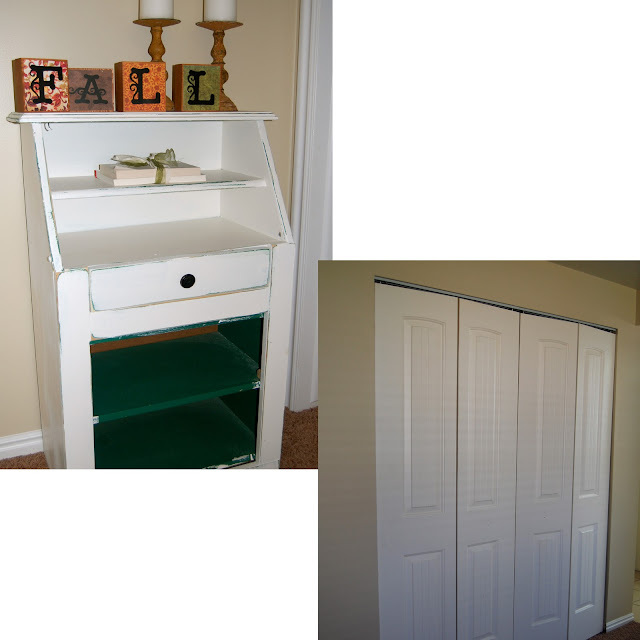 Right: Need molding on doors but just shortly after starting I found these Farm House Pantry Doors and want them more than what I have started. Added to the not quite finished items is our play house. My husband made up the plans and we had a great time putting it together this past spring. We had kids in and out of it all summer. One of those 100% worth the time and money projects. Well, those are most of the house projects. 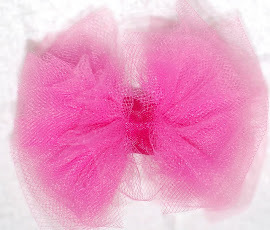 I have a gazillion things I still want to do, re-finish the bathroom, make a better office, craft and laundry room. Even do something with the toy room. The great thing is that I get year two and I get to share those good times with you as I make things happen. Wow! You are amazing! The mirror looks great! It's fun to see all your work laid out like that! The red couch is my absolute favorite!! It's the reason I started following you and I still love it now as much as I did the first time I saw it!